Well, no, so you can relax. If there is anything extra-special about today, it’s that Ryan Peterson, the character/creature sculptor & designer for The Price is celebrating his birthday! And since he features so prominently in our next Videoblog, what better day could there be to post it than today? I got the very best man for the job, didn’t I? And if you’d like to learn more about Ryan and his work, you can check out his blog/portfollio, read this great interview, or you can write him at ryankpeterson2003@yahoo.com … Happy Birthday, Ryan!!! And one last thing: the doodle I made for National Doodle Day’s charity eBay action only has 2 days left (recognize it?)!!! 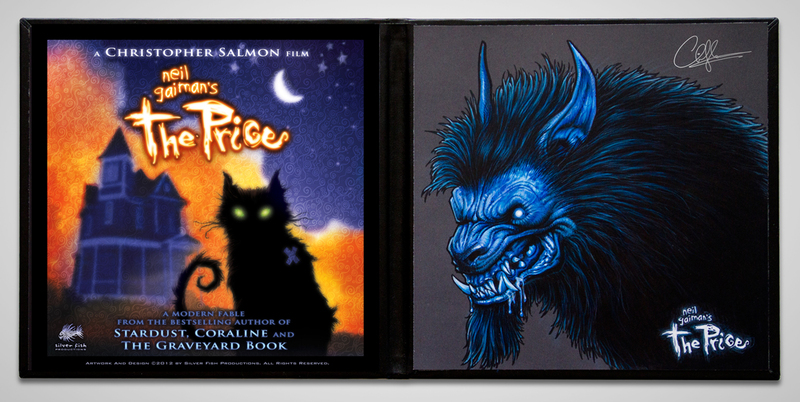 Check it out, along with other celebrity doodles (a term I apply rather loosely to my own piece) by my Co-Producer Cat Mihos and by Mr. Neil Gaiman himself!!! This entry was posted in The Price. Bookmark the permalink. Nice! Scary = awesome (in my book, anyway)! Awesome update! So much eye candy. I have nothing terribly useful to say, but it’s all looking great. Much encouragement to you guys. I think the version of Neil you ended up with is absolutely perfect, too. Thank-you muchly, my friend — regardless of your self-deprecation, it is always great to hear from you, buddy!!! Awesome video! Kudos to Ryan. Happy Birthday indeed. Excellent video block Xtopher! Very entertaining! Thanks for sharing all this! Thanks Gee-off!!! Glad you got a kick out of it!!! Wonderful! I loved the walk-through of your design thinking and collaborators. The latest versions of devil-dog and Neil are very compelling – the former is _viscerally_ scary and the latter definitely looks like someone a thoughtful chat could be had with. More! Thanks Trevor — great reactions! And yes, “more” is most definitely the mandate of the moment! *Throws hands in the air like the tricycle kid in The Incredibles* That… Was… Awesome! *gently sobs into keyboard* I really thought my own toy collection was okay… up ’til now. I bet it’s really easy to stay in the office all day! But man. Really – I’m lost for words. Suffice to say I’m ‘feeling’ the biggest, bestest, superhero-est, monster-sized compliment to both you and Ryan for all that raw talent! Keep going. I'm on the edge of my seat already! It’s incredibly fascinating to gain this glimpse into the creative process. And also frustrating as hell, because I want to see this movie now! Anyway, keep up the excellent work!! … and yes, I’ll readily admit to several — shall we say, deficiencies — in my collection! 😉 Thanks my friend!!! More comments once I can get back to this post! wow,just wow. thanks soooo much for the update Chris! the artwork looks incredible and I was blown away when you showed the final Neil (watched this vid in HD on my Plasma, gorgeous!!!) I cant wait to see more behind the scenes. Thanks BeeJay — and I’m glad it looked good on your sweet Plasma! I’m making everything at 1080P for eventual inclusion (in greatly expanded form) on the Blu-Ray, even though I know most people right now are only seeing things at web-res. MONSTER DOG! = a very happy me. I love monsters and creatures; you guys have done an awesome job. Ah, we are clearly of the same ilk, my friend! Thanks Ranti … sausage-making process indeed! Very cool video! I’ve been waiting to see a good close-up of the toys in your office! 😉 Nice way to set off the update about monster sculpture. Can’t wait to see more. Keep up the good work, guys! I am blown away at what I’ve just seen – total mind melt in a good way. I could look at those sculptures that Ryan Peterson did for hours. I mean the details! And I never thought of it that way, that the fine art principles can be used in the sculpture. I love when he said “moments of drama” and “your eyes are drawn to it.” This is very true because I can’t stop looking at them, so much detail and design. I really learned alot from this video, thanks so much for what you and your team are doing. Thanks Dwayne! Ryan is very eloquent at explaining things that can be difficult to put into words; so glad you enjoyed the video! Hi Christopher! Wonderful video and update – I love learning about the process! Can’t wait to see more. Just wondering, are you still planning on making your documentary on Neil, the Castle Gaiman film? I desperately hope so!! Love it! Thanks for the updates. I remain as excited as ever. Amazing update! Ryan’s work is just fascinating, and the model’s for Neil and the demon dog look great!!! Glad you like them, Heather! I just want everyone to see what’s been going on & feel some of the energy from my little team! Wow, the monster dog just looks awesome, scary awsome. That’s really great work. Thanks for the interesting insight into Ryan’s Work :). And your monsters collection is definitely great too, I have to admit I got a little bit jealous.